WHAT ONCE STARTED WITH AN 11 YEAR OLD WHO HAD NEVER SEEN A MOUNTAIN OR OCEAN, SOON TURNED INTO A SPONTANEOUS 30 HOUR DRIVE ACROSS AMERICA WITH DUSTIN GRICE AND DALLAS LIGHT CREATING THE FIRST EVER “LIL PROS BMX TOUR” THROUGHOUT SOUTHERN CALIFORNIA STARRING THE YOUNGEST TALENT IN BMX. Posted on November 8, 2018 Author Lil Pros TourCategories MinnesotaTags Minnesota, North America, United StatesLeave a comment on Lil Pros Tour JAPAN! Welcome to Minneapolis… America’s sizzling hotbed of Action Sports, and the brand new home of X Games thru 2020. X Games asked Lil Pros Tour to invite 6 lucky kids to join them on the interactive Sour Punch Course, including 3 local kids from Minnesota (Dallas Light, Reed Bleymeyer, and Isaac Zimmer), 2 kids from … Continue reading Lil Pros Tour at X Games !! Posted on July 16, 2018 Author Lil Pros TourCategories MinnesotaTags Minnesota, North America, United StatesLeave a comment on Lil Pros Tour at X Games !! Lil Pros Tour is beyond excited to be onsite at @XGames Minneapolis 2017 !! Which kids around the world do you think should be here riding ?? Tag a friend & join us outdoors for live demos @USBankStadium on the Sour Punch Next X Park this Friday, Saturday, and Sunday #LilProsTour#SourPunch #XGames #LinkFoundation #RideMN Source: Lil Pros Tour … Continue reading Lil Pros Tour is beyond excited to be onsite at X Games Minneapolis 2017 !! 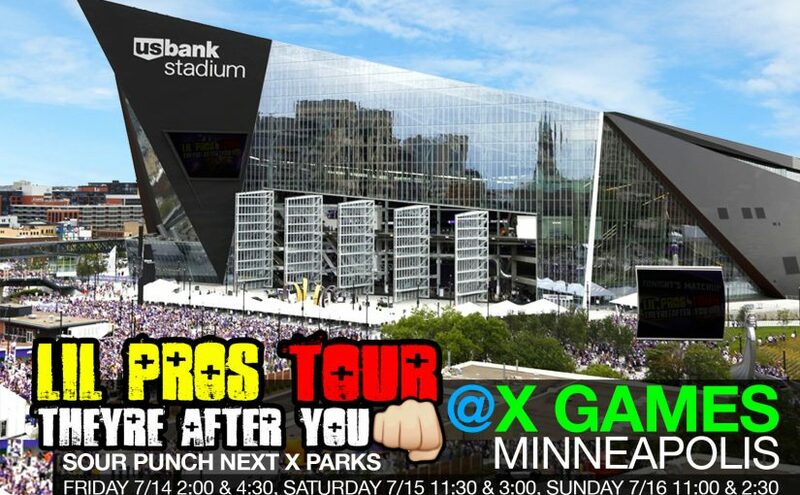 Posted on July 11, 2017 Author Lil Pros TourCategories MinnesotaTags Minnesota, North America, United StatesLeave a comment on Lil Pros Tour is beyond excited to be onsite at X Games Minneapolis 2017 ! !